Frankie Lee Sims (April 30, 1917, New Orleans, Louisiana – May 10, 1970, Dallas, Texas) was an American singer-songwriter and electric blues guitarist. He released nine singles during his career, one of which, "Lucy Mae Blues" (1953), was a regional hit. Two compilation albums of his work were released posthumously. Sims was the cousin of another Texas blues musician, Lightnin' Hopkins, and he worked with several other prominent blues musicians, including Texas Alexander, T-Bone Walker, King Curtis and Albert Collins. Sims is regarded as one of the important figures in postwar Texas country blues. Sims was born on April 30, 1917, in New Orleans, Louisiana, to Henry Sims and Virginia Summuel. He claimed he was born on February 29, 1906, but 1906 was not a leap year, and April 30, 1917, is generally accepted as his birth date. He was the nephew of the Texas blues singer Texas Alexander and the cousin of the guitarist Lightnin' Hopkins. Both Sims's parents were "accomplished guitarists". His family moved to Marshall, Texas, in the late 1920s. At the age of 12 he learned to play the guitar from the blues musician Little Hat Jones and ran away from home to work as a musician. In the late 1930s Sims had a dual career as a teacher in Palestine, Texas, on weekdays and a guitarist at local dances and parties on weekends. When the United States entered the Second World War at the end of 1941, he enlisted and served in the Marine Corps for three years. After the war Sims made Dallas his home, where he pursued a full-time career in music. In Dallas, Sims performed in clubs with the blues guitarists T-Bone Walker and Smokey Hogg. In 1948 he recorded two singles for Blue Bonnet Records, but his first success came in 1953 when he recorded his song "Lucy Mae Blues" for Art Rupe's Specialty Records, which was a regional hit. The Encyclopedia of the Blues called "Lucy Mae Blues" a "masterpiece of rhythm and good humor". Sims continued recording songs for Specialty through the mid-1950s, many of them not released at the time. In 1957 he moved to Johnny Vincent's Ace Records and recorded several songs, including "Walking with Frankie" and "She Likes to Boogie Real Low", which AllMusic called "mighty rockers". Members of his band in 1957 were Willie Taylor (piano), Jack White (tenor saxophone), Ralph Morgan (bass), and Jimmy "Mercy Baby" Mullins (drums). Sims also recorded with other blues musicians, including his cousin Hopkins, and performed on several of their records. In the early 1960s Hopkins took advantage of the folk blues revival, but Sims faded into obscurity. In 1969 the blues historian Chris Strachwitz located Sims to record him for his Arhoolie label. Sims died soon after, on May 10, 1970, in Dallas at the age of 53. The cause of death was pneumonia brought on by poor health. At the time of his death he was reported to have had a drinking problem and was under investigation regarding a "shooting incident". Soon after his death, Specialty Records released Lucy Mae Blues, a compilation album of his recordings with the label. In 1985 Krazy Kat released Walkin' with Frankie, an album of unreleased songs he recorded for the label in 1960. Along with Lightnin' Hopkins and Lil' Son Jackson, Sims is regarded as "one of the great names in post-war Texas country blues". According to the Encyclopedia of the Blues, he had a "considerable" influence on other musicians in Dallas. T-Bone Walker acknowledged Sims's influence on his style of playing, and Hopkins got some ideas from him. Sims also guided several musicians at the start of their careers, including King Curtis and Albert Collins. Sims's style of guitar playing was to produce rhythmical patterns over and over, but with a slight change in each repetition, giving his music an "irresistible dance beat". He produced a "twangy, ringing" sound on his electric guitar, which was "irresistible on fast numbers and stung hard on the downbeat stuff". ^ a b c d e f g h i j k Dahl, Bill. "Frankie Lee Sims". AllMusic. Retrieved 2010-10-19. ^ a b Harris, S. (1981). Blues Who's Who. New York: Da Capo Press. p. 461. ^ Sims, Frankie Lee. Lucy Mae Blues LP sleeve notes. Specialty SP/SPS 2124 (US). ^ a b c d e Bentley, Chris (April 1985). Walkin' With Frankie LP sleeve notes. Krazy Kat KK7428 (UK). ^ a b c d e f g h Herzhaft, Gérard; Harris, Paul; Haussler, Jerry; Mikofsky, Anton J. (1997). Encyclopedia of the Blues. University of Arkansas Press. pp. 187–188. ISBN 1-55728-452-0. Retrieved 2010-10-19. ^ Marion, J. C. (2007). "Some Texas Blues: Frankie Lee Sims and Mercy Baby". Retrieved 18 May 2014. ^ a b c Wirz, Stefan. 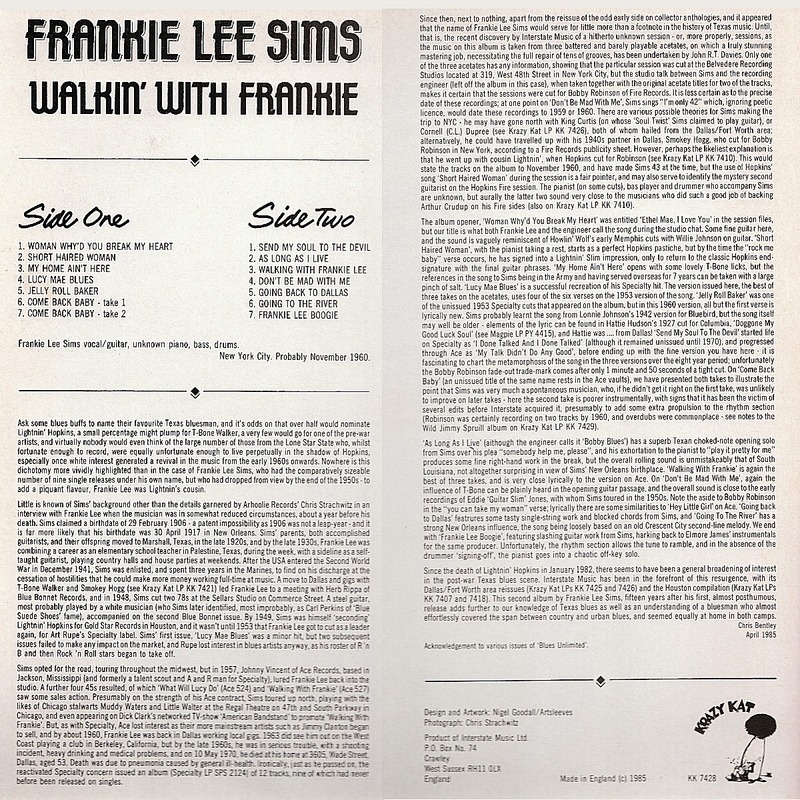 "Frankie Lee Sims Discography". American Music. Retrieved 2010-10-19. ^ Koda, Cub. 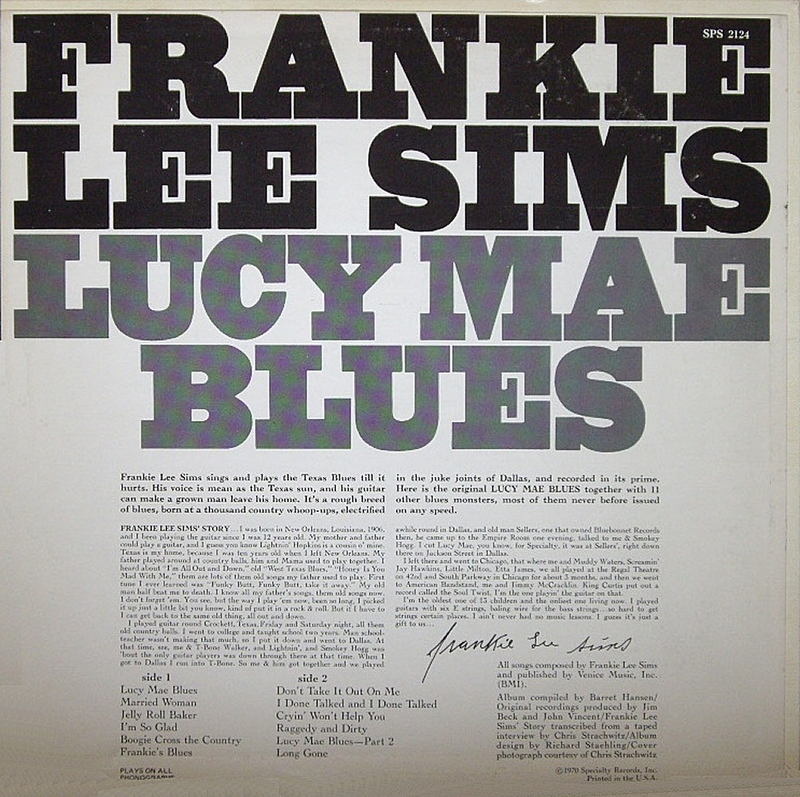 "Lucy Mae Blues". AllMusic. Retrieved 2010-10-19. This page was last edited on 30 January 2019, at 06:33 (UTC).